ROAD TOWN, BVI, December 03, 2012 – Grande Vegas Casino is hosting two freeroll slots tournaments over the holiday season. Between now and Christmas there’s also a Facebook contest, a Live Raffle and the online casino’s first Free Spins Weekend. Players have until December 10th to achieve the highest score in the $2000 December Slots Freeroll that’s being played on the Texas Tycoon slot. The $3000 Holiday Slots Freeroll December 13 – 31 will be played on a Christmas favorite, Naughty or Nice. 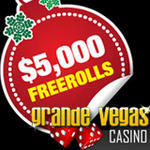 Freeroll slots tournament details are available at: http://www.grandevegascasino.com/xmas2012.aspx. These special tournaments are in addition to the $100 Weekly Freeroll and the weekly $250 Guaranteed Tournament. The December Live Raffle will be held on December 12th. All players need to do is log on (in real money mode) between 11am EST to 1pm EST. Everyone can win, there’s no deposit required. But players who deposit on December 11th or 12th will get 10 extra tickets in the random draws. The coupon code RAFFLE1212 is good for a 100% deposit bonus (up to $100) on December 11th and 12th. Grande Vegas Casino has a very active community of online casino players on Facebook and this month they’re sharing favorite bakery recipes. Every week until Christmas one of the festive bakers will get a $100 casino bonus. Grande Vegas Casino features Las Vegas favorites like Blackjack as well as dozens of amazing slots games like the brand new Elf Wars, making it popular with online casino players around the world. A property of Tigress Management Ltd., BVI, Grande Vegas Casino offers more than 300 games provided by Real Time Gaming (RTG) including million dollar progressive jackpots such as Jackpot Pinatas, Caribbean Hold’em, Mid-Life Crisis, Shopping Spree and Aztec’s Millions. Every casino game features state-of-the art graphics and sound to provide a unique gaming experience. Instant-play Flash versions are available for most games. With its variety of deposit options Grande Vegas Casino is capable of serving players all over the world.